Here I am back in casa de tronster. Making a time of getting ready for work. I have been off since Friday. Christmas has come and gone. It was a good Christmas, even though I didn't visit parents of Tronster, however, brother of Tronster did make the trip up from Florida. It was his first long drive, and he survived OK. I am certianly proud of his accomblishment. I spent the morning and lunch with foxy nieghbor. Helping her shop for furniture. We have a good time hanging out and doing such things. More about her later, must ask permission to talk about her, you know. 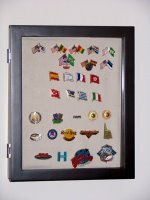 Today a purchased a showdow box to display all my "pins" that I have collected over the years. What do you think? Some are flags from recent road trips, and some are from the old navy days. I will be starting a new picture series. Please stay tuned. 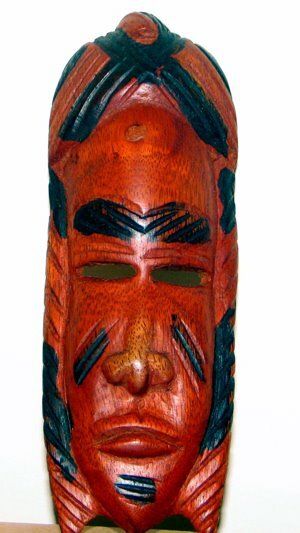 The "MASK" will be traveling with me and I plan on taking pictures of him and his adventures. I picked him up in Africa on my first trip. I want to know about "Foxy" neighbor!! !